Kick off 2014 wrong with The Criminals & VKTMS in Frisco! 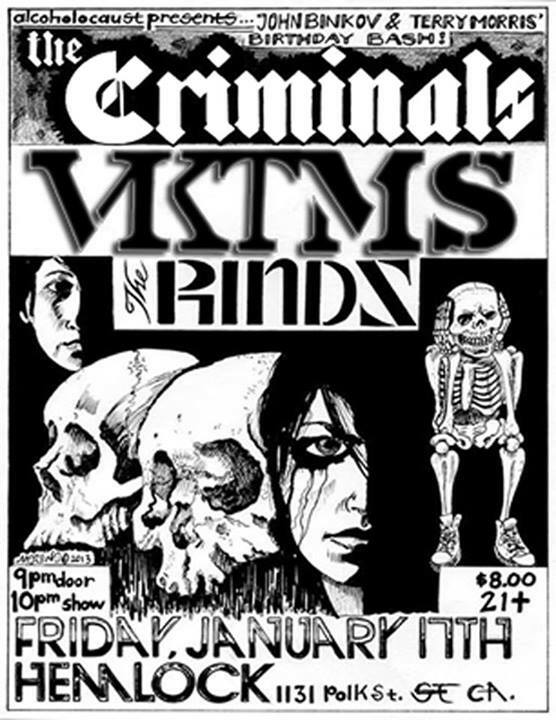 We’re invading Baghdad by the Bay with VKTMS (the legendary 1978 SF punk band) and The Rinds! We haven’t played SF for 2 years, so don’t blink or it’ll be 2016. Start off 2014 with friends and enemies alike at the Hemlock on Polk Street. It’s 21+ so bring your fake ID! Facebook event page with the mostest! The other Facebook event page with the mostest! Notes: THE CRIMINALS, VKTMS, & THE RINDS!